""[Application]" requires a provisioning profile. 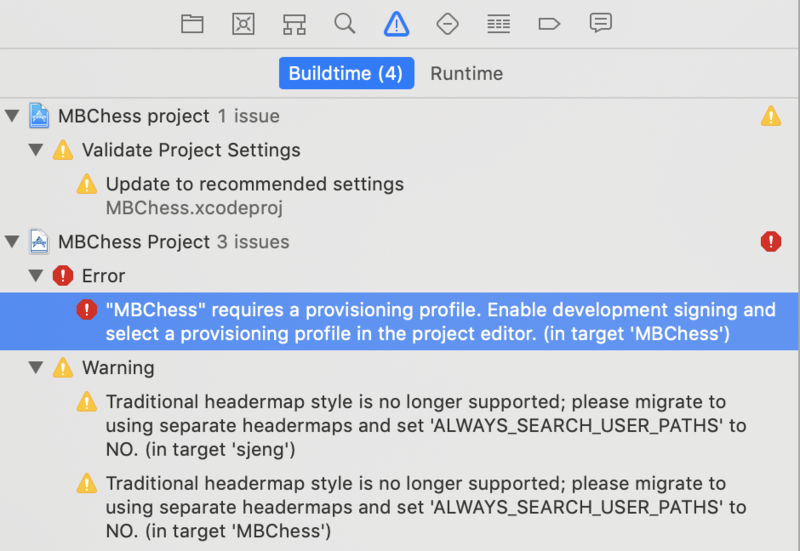 Enable development signing and select a provisioning profile in the project editor"
I was trying to find solutions to similar issues, but the project file "MBChess" does not have the tabs mentioned in other answers (such as "General"). How would I get the app to build and run on my machine? 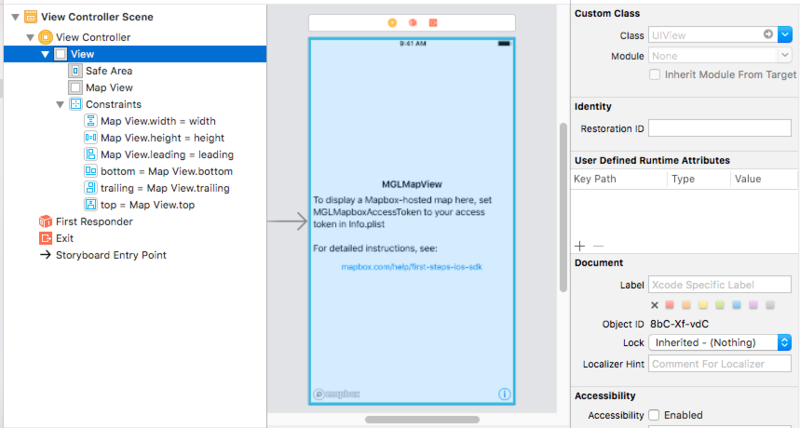 I installed mapbox into my xcode project using cocoapods. Then I just copied and pasted the example for creating a custom user location annotation into my view controller. I get the following errors over and over again. They seem to happen when I zoom in and out of the map, or sometimes when I move the map. and AppDelegate.swift, which was created automatically(I've remove the comments from the AppDelegate). I have a .command file that I want to run on startup. However, it occasionally does not run but instead prompts the user to press enter before it executes (image below). I have tried setting the .command file as both a .plist and a login item but it gives me the same issue. Any ideas how to fix this? NOTE: This does not happen on every reboot but I can't seem to understand why it happens when it does. I'm trying to add a preferences window to my Mac app so that I no longer have to create multiple versions of the program to cover different groups. My two preference options will include color (I only offer 2 colors) and team (again, only 2). EDIT - This issue is fixed My first issue is that the radio buttons aren't connecting to any of my swift documents - I've tried the main program's appdelegate and ViewController, as well as the view and window controllers for the preferences window - when I drag the connection, I'm not able to drop it anywhere. What am I missing? Once this is figured out, then I will need to connect the radio buttons to preferences that will be utilized in the main program - I think I can figure that out with if statements, but the color one is my next issue - I have labels that are normally black - can those change to white if someone clicks purple? I don't want the normal text color to change, since those boxes stay white. 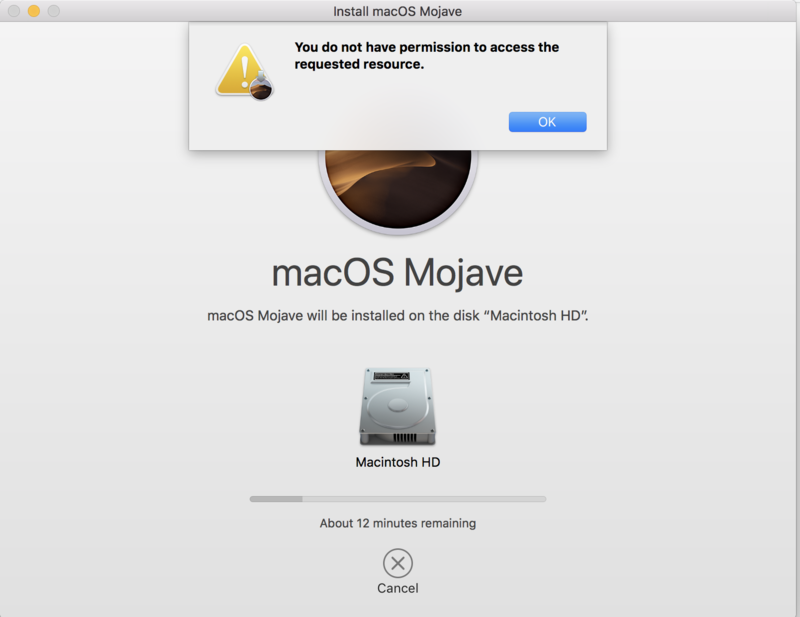 I downloaded Mojave installer from MacAppStore, now every time tries to run the installer it stuck in between and gives following error. As I am using Admin user. Resetting permission from Disk Utility (Running First Aid). Logged in to mac app store and iCloud as well. After upgrading to the macOS software update Mojave 10.14.4 (18E226), my mac stopped working. The bluetooth first stopped responding, then browsers (Chrome, Firefox, Safari) stopped as well. This issue is persisting even after force restart. The issue happened to many of my coworkers who had upgraded to the Mojave as well. Anyone has similar issue and has a possible fix? I'm part of a team developing applications for flight simulation. One of these applications is running also on MacOS and needs access to the microphone to communicate with online virtual air traffic control. Starting with MacOS 10.14 microphone access is no longer working. It used to work perfectly in any previous version of MacOS. I've read that starting with 10.14, MacOS will ask the user for permission, but this dialog never appears. Using portaudio as the audio library, audio input stream is successfully opened. No warning, no errors, nothing pointing to a problem. It just doesn't return any audio input. but this didn't help. Others suggested that adding <key>CFBundleDisplayName</key> fixes the problem. But it didn't. It is maybe worth to note that the application is not signed. Its is a spare time hobby project for which I'm not willing to spend 99 $ a year for Apple's code signing process. Could that be the culprit? Any advice or ideas are welcome. As a temporary workaround, we told users to start the binary from the app bundle via console, which fixes the problem. But I would like to properly fix it also for the app bundle itself.